When do injured runners really have to stop running? Today we are talking about when injured runners really have to stop running. That’s the big concern we all have as runners. It is a pretty common question when runners get injured. So today I’m going to share my opinions about when people should stop running and not stop running. All of the information I’m going to present to you today is based upon on a lecture that I first presented to doctors at the International Foot & Ankle Foundation meeting at the annual medical conference in Lake Tahoe. I have given that lecture at medical conferences a few times. These are medical conferences that are organized for physicians so that they can get their continuing medical education credits. What I’m going to do here is present the information to you and try to explain the material that was presented to doctors during that lecture to help you understand what doctors are thinking. This should also help you understand the questions you should ask them when you want to keep running, if you have a foot and ankle injury that may be related to running. The first goal of the lecture was to discuss the idea of the “standard of care” for common running injuries. A second goal was to make sure that doctors could understand the difference between runner’s expectations and physician expectations. As a runner, when you go to the doctor to get help with the running injury, you probably expect the doctor is going to give you a strategy that will help you continue to run. After all, you are a runner. You want to run! The doctor may be thinking something completely different. That’s not to say that the doctor isn’t trying to get you better. The physician really does want your running injury to get better. But the physician’s perspective is different. Doctors are trained to make your injury improve as fast as possible. Often times that improvement is at the expense of your desired activities. If you want to run, and running is somehow perceived as harmful and the doctor thinks that continuing to run will make that injury worse or stopping running will be helpful to heal the injury faster, the doctor will simply tell you to stop running. Obviously that is not really what you want. But the point here is just to help you understand that the physician may have a very different perspective than you the injured runner. My main goal in giving this lecture at the medical conference was to help physicians understand how to think about running and running injuries a little bit differently. One key component of the lecture was explaining the concept of damage control. Because it is important to teach physicians that in many cases it is possible for a runner to continue running and still heal. This particular section of the talk can be particularly useful to you as an injured runner when you go back to your doctor and ask her to develop strategies that will help you continue to run. Because you have to come up with some new strategies if you want to remain active, maintain your running fitness and continue to heal. In the very last section of the lecture, what I did was explain to physicians when it is really necessary to stop running. I help them understand when I believe it is so high-risk if you continue to run you could really and truly do permanent damage to yourself. Making one small injury a little bit worse may not be that big of a deal. But if you do so much damage to one injured structure in your foot that it really does severely limit or prevent you from running permanently, for the rest of your life, then we as physicians just have to say “no.” You have to understand which conditions those are so that you can make sure that you are not running on some injury that could make you a lot worse. You may have been on the receiving end of this sort of thinking as well. I have myself. A long time ago, I used to race motorcycles professionally. At one point I injured myself a couple of times. That may not come as a surprise to you because racing motorcycles is inherently dangerous. But the bottom line is that I had a really serious injury to my knee. I had torn three ligaments and my knee was dislocating during races. That was a problem. I went and saw an orthopedic surgeon. He had already previously performed another surgery on my injured knee. He had all of the right credentials. He was highly qualified. He taught orthopedics at a University Medical Center. He was a nice guy. And he had done my previous arthroscopic knee surgery. That may sound like an extreme example. But if you think about this in terms of running it may help you understand that when you see a doctor they don’t take your desire to run very seriously. After all at the time I had this exchange with the orthopedic surgeon I was racing motorcycles professionally. But when you go see the doctor and you tell her you like to run they just think you have a hobby. But I suspect that any runner reading this right now will agree that running isn’t really a hobby for real runners. We all run for lots of different reasons. But running is not just a hobby. Running is not something that you do to pass the time. Running is part of our life, and our lifestyle. Running is integral to who we are as people. 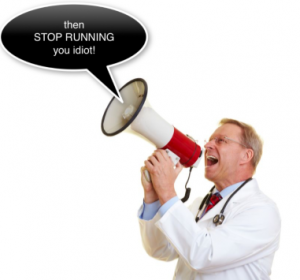 It isn’t reasonable for a doctor to ask a runner to stop running. When a runner is told that they need to stop running, they see this very differently than a doctor does. I have a slide in my lecture that has a quote from Scott Tinley that I shared with the audience in that talk. There’s no question. That quote is largely representative of the way a lot of runners think about running injuries and how it may affect their running goals. On a personal note I can tell you that it took me a long time to qualify for Ironman Hawaii. When I finally got a slot to the Ironman Triathlon World championships, as luck would have it, I got sick in the weeks leading up to the race. 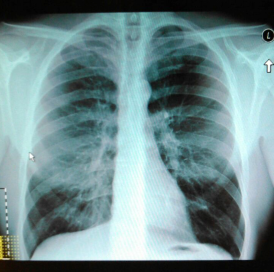 Right before I was leaving for Kona, I was getting a chest x-ray. I had this issue developing where I was having trouble breathing, I was getting lightheaded and it had become increasingly difficult to train. I was worried that I had pneumonia. Of course I’ve known him a long time and he knows me. He also understands runners and he’s a runner himself. He didn’t tell me to just skip the race because it’s really not that simple with a race like the Ironman World Championship. One thing that doctors don’t always understand is what the real goal is. Doctors are taught simply fix the problem. Now if you are a patient or an injured runner reading this, you probably already know that the correct answer is very obviously d. help the patient achieve his/her goal. If your goal is to run a marathon, that’s the goal. If your goal is to run a marathon in three hours, that’s the goal. The task for the doctor is to help you figure out how to run the marathon in three hours or less, hopefully without pain. Invariably though, when I ask doctors in the audience which is the correct answer, they mostly say the correct answer is b. prevent further tissue damage. Their primary concern is that you don’t get worse. That thought process comes from the Hippocratic Oath which teaches physicians that first and foremost they should do no harm. They should never do anything it will make you worse. So it’s not surprising that many of them will think that “b. prevent further tissue damage” would be the correct answer. Of course, hedging their bets there are also lots of doctors answering “all the above.” But when I really press them and say if you can only have one correct answer which is it? Most will say that the doctor should prevent further tissue damage and then some others to a lesser extent will say that the overall goal should be to make the pain go away. But to you reading this, you know that doesn’t really matter. You don’t really go see a doctor just because you’re in pain. 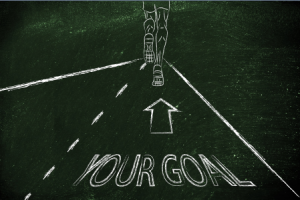 You go see a doctor because you have a goal. The issue is that the pain that you have is interfering with your activity and the achievement of your goal. I explained to the doctors in the audience, that every patient coming into their office with a running injury has a goal. Every single one. The goal for that runner is not to make the pain go away. The goal for that runner is not to prevent further tissue damage. Every runner that comes into your office has either a specific number of marathons that she wants to run or a specific race that she wants to run. In the overwhelming majority of cases she will have already signed up for a race that will happen on a very specific day and she will have a very specific time goal that she wants to achieve on that specific day. Your task as a doctor is actually to get that runner to the starting line on that day and across the finish line within that specific time, without making the injury worse, and hopefully pain-free. 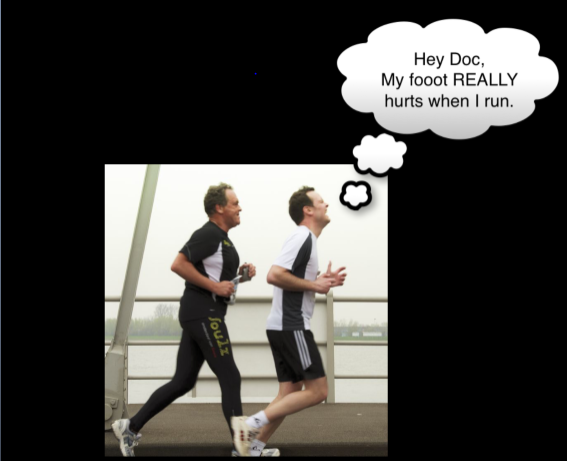 Then I go into a discussion with these doctors about what really causes overuse running injuries. I start by explaining that we should discuss all of this in terms of the factors that can really contribute to, or directly cause, running overuse injuries. There is this idea that overuse injuries are caused by the “terrible too’s”: running too far, too much, too fast or too soon. An example of this would be the person who declares some New Year’s resolution to lose weight by taking up a new running routine. He goes out and he runs a little bit, maybe on a walk run routine on the first day. He starts getting stronger. He runs more and more. Although he may feel good in his progression, he may be increasing his distance faster than his body can absorb all of the strain. And so he gets an over training injury. That certainly can be true. But the way I think about this is in a way that you could chart on a graph. If you think about risk and stress and how they are related in terms of time and amount of activity, we know that somewhere between doing nothing and doing too much you will get an over training injury. We can think of this imaginary line on this continuum as your threshold for injury. If you are laying on the couch or sleeping, there is no risk of an over training injury. You are as far away from your threshold for injury as possible when you’re doing nothing. If you’re all the way at the other end of the spectrum where you’re doing an ultramarathon every day, you are at high risk of an over training injury. Sooner or later, you would probably get some type of running injury because you are applying so much stress to your body on a daily basis. At some point you will surpass your body’s ability to absorb all of the force you are applying to it and something breaks. There are a whole range of stressors in between that can affect your body’s ability to absorb, or compound, all of the stress from running. Mechanical stressors can be thought of in terms of your particular running biomechanics, the force of gravity when your feet hit the ground as you run, or your particular running form. You might consider the types of running surfaces you choose to run on which can either increase or decrease the amount of force that is applied to a particular structure in your body. The angle of the road underneath you can greatly alter the amount of force to one side of your foot versus another. The types of running shoes that you choose can either cushion and absorb force or they could increase the amount of force if they’re too stable. All of these different considerations can affect the amount of mechanical stress applied to your body when you run. 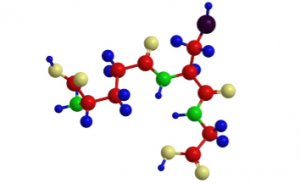 You can also think about oxidative stress. What actually happens physiologically in your body? What happens with you in terms of the metabolic waste products that accumulate as a result of activity and tissue damage? 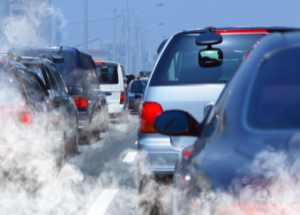 automobile exhaust you’re likely to inhale fumes that your body has to process in a way that can be stressful to your system. We all know that pollution is counterproductive to athletic performance. Hormonal stressors can also greatly influence your body’s ability to absorb external stressors. 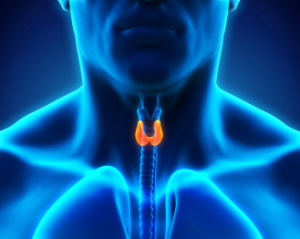 Thyroid dysfunction, pituitary gland irregularities and a number of other disruptions of hormonal regulation can go awry and contribute to increased stress in your body. 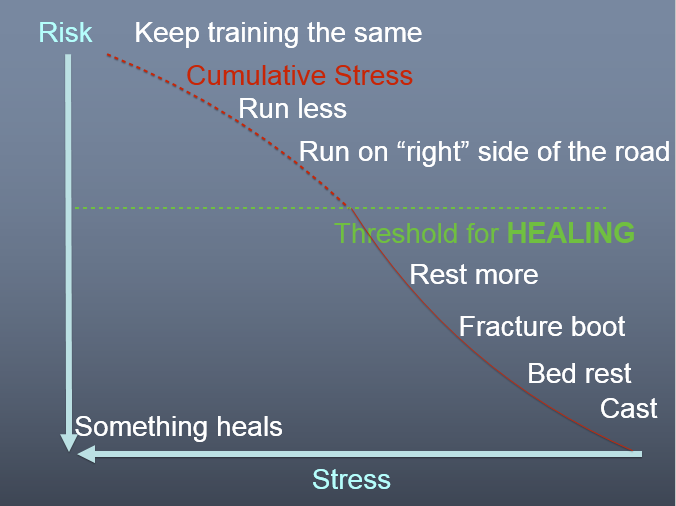 If you get too much cumulative stress you cross over your threshold for injury. The thing that is interesting is that it seems many of us, including physicians and runners think primarily about the mechanical stressors. But I really think its simple math. You have to consider all forms of stress in the equation. 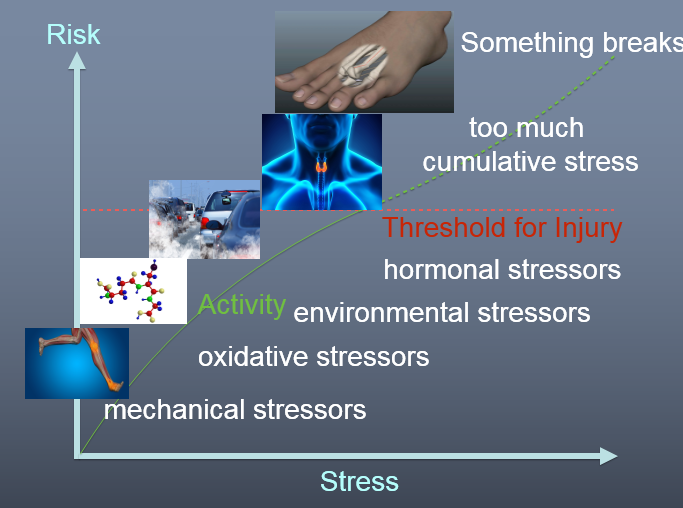 If you have too much hormonal stress, environmental stress or oxidative stress putting a load on your physiologic system, then your body is less able to absorb mechanical stress and you are at more risk of an over training injury. You have to pay attention to all of these other stressors. If you can reduce the other stressors and manage them in some way, then in theory, you should be able to increase the amount of mechanical stress (like running) and then run further without significantly increasing your overall risk of developing an overuse injury. Another way to think about this is to flip that same graph. Instead of thinking just about your threshold for injury, you can turn this whole idea upside down and think of it as your threshold for recovery. Think of that same line as your threshold for healing. If you can reduce all of the stress enough you should be able to heal. If you have an over-training injury it seems reasonable to believe that most doctors can help the patient to reduce the cumulative stress enough so they can get under that threshold for recovery and healing. The most stressful factor and the highest risk activity might be running, specifically running and training at exactly the same level that caused the injury. That part is not very difficult understand. If the amount of force and stress you were applying to your body was significant enough to cause an injury in the form of tissue damage, there is no reason to expect that you will have the capacity to heal that injury if you continue applying the same amount of damaging stress. You shouldn’t expect that you would get better, you should instead expect you’ll just continue to get worse, unless you change something. You could run a little bit less. Reducing the stress by running less certainly would help move you lower along that continuum and closer to your threshold for recovery. That seems to be the first thing doctors want to recommend. And often they will tell you to stop running altogether. You could figure out a way to reduce the stress specifically on the one structure that has been injured. This may mean running on the “right side” of the road. In this scenario you’re simply using the slope of the road to deliberately either pronate or supinate the foot in such a way as to decrease the stress on the structures that have been injured. If you reduce the force enough it may get you under threshold for healing. You have all of these different ways that you can attempt to reduce the stress. You can change any of the factors that might alter the total amount of stress in your system. You can address your nutrition to increase your antioxidants or protein intake. You can make sure that you’re getting appropriate amounts of sleep. You can offload the injured structure with custom orthotics or padding. And you can focus on inflammation reduction. You can analyze and modify your running form in a way that may reduce the stress to help the injury heal faster. You have to think about all the good things and bad things that you can adjust as a part of this equation. The bad things, the “poison” to your system maybe running further and increasing mechanical stress. Rest deprivation decreases your body’s ability to heal. Dehydration makes it more difficult for your system to deliver nutrients to the tissues remove metabolic waste products. Too much pressure in one area delivers an excess stress to a certain tissue. Biomechanical derangements can load your foot and your body asymmetrically in a way that increases stress. And then you have all of the forms of inflammation that can do damage to your system. Of course the solution is just to do the opposite of introduce poison. You need an antidote. That may mean less running or more rest, increasing your hydration by drinking more water. Your doctor may recommend special custom molded orthotics that will help you run with decreased stress to a particular structure. You may need to have a running form evaluation and try to develop a more efficient running form. Do whatever you can to address the excess inflammation. With all of these factors considered, you have lots of options and many different ways to move that imaginary line of your threshold for injury, or your threshold for recovery up-and-down that continuum. You have it in your power to manage and modify all of these different forms of stress. This is what you and your doctor have to both understand. The standard of care is an interesting idea and it certainly makes sense in terms of cost containment. When there is only so much money or resources available to a given healthcare system, it’s important to do what is most efficient and most effective for most of the patients, most of the time. 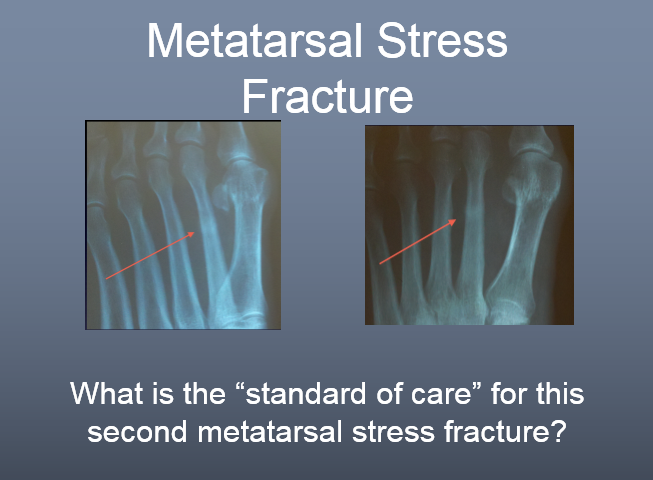 To discuss this idea in the lecture to physicians I have a slide which asks, “What is the standard of care for a second metatarsal stress fracture”? A metatarsal stress fracture is pretty common as a form of running injury. I ask one of the physicians in the audience. They will often answer that the standard of care is a fracture walking boot for six weeks. Some doctor in the audience will then reiterate the standard of care for second metatarsal stress fracture is a fracture walking boot for six weeks. Then I typically ask if there anyone in the audience who disagrees with that answer? No hands. 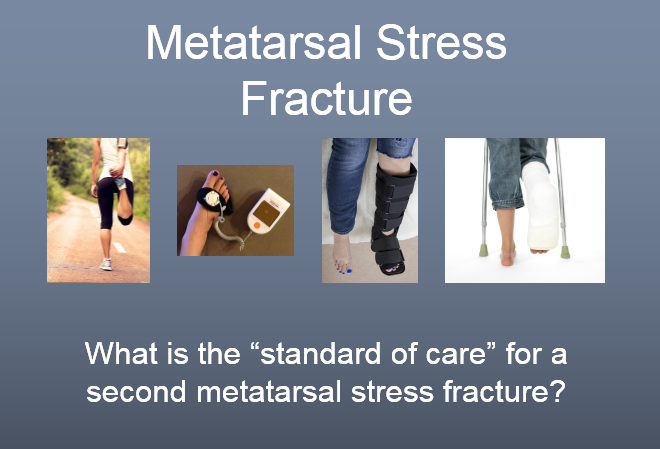 The next slide in the presentation is a different foot with a different second metatarsal stress fracture. It is a little bit different because it is a slightly different type of stress fracture. Of course, it is still just a second metatarsal stress fracture. I then ask the audience if there is anyone who disagrees. Of course, no hands. The next slide is a picture of two patients. I ask the audience, “What if the first patient is a 32 year old super-fit ultramarathon runner who developed her very first injury ever, a second metatarsal stress fracture, while running a 100 mile trail race? And what if she has no past medical problems she’s taking no medications and she’s never been injured before. Is there anyone in the audience who may believe it will actually take her six weeks in a fracture walking boot heal?” Because it seems like no matter what, she’ll heal faster than that because she’s so young and healthy. And what if the other patient is a 78-year-old, 350 pound smoker with uncontrolled diabetes, impending kidney failure, peripheral vascular disease, malnutrition and thyroid dysfunction? Are there any doctors that believes even if we admitted him to the hospital he might be able to heal that injury within six weeks? Because it seems incredibly unlikely that he would heal this stress fracture in the same amount of time, no matter what the circumstances. Physiologically he’s just not capable of healing anything very quickly. The truth it seems, is six weeks in a fracture walking boot isn’t the correct treatment for either of these two patient scenarios. Yet as a reflex, most doctors default to the standard of care. Some doctors seemingly use the standard of care as an excuse to not think about what is actually best for a runner who wants to continue to run. It is essential that you and your doctor consider very carefully what is really necessary, and what it will really take for you to heal your running injury. The following slide is an image of a guy was an Ironman triathlete. 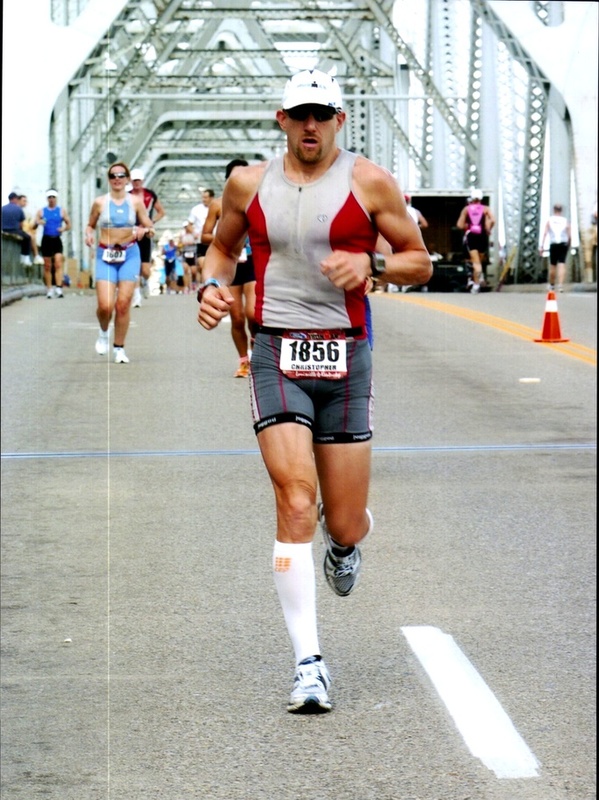 He got a metatarsal stress fracture while training for Ironman Louisville. Four weeks out from the race he was told that he had a stress fracture and would not be able to do the race. To make matters worse he was told that he would need to wear a fracture walking boot for six weeks. He called me for a second opinion because he was freaked out by the idea of not doing the race when he had been training for the better part of the year. I walked him through the options. We talked about how to offload that particular metatarsal. We talked about some strategies to reduce the stress and maintain his fitness over the final four weeks leading up to the race. He got through the race and he did just fine. He did not make the injury worse. I saw another patient training for Ironman Louisville just this year with almost the exact same scenario. She had another stress fracture and was told she should not do the race. She trained through the final four weeks even with the metatarsal stress fracture. She also finished her race. Keep in mind she also had been told that she needed to spend six weeks and a fracture walking boot. For her, it was actually her fastest Ironman race ever! This scene has played itself out over and over when I have provided second opinions for patients. You can modify all of these different factors so that you can continue to train and heal. You can figure out ways to take the stress off of that one structure, you can manage your nutrition, you can manage your sleep better. There are many different ways to decrease stress. You don’t always have to stop running. Nutrition certainly has a whole lot to do with what you take in when you eat, or refuse to eat. But if you have irritable bowel syndrome, you may have difficulty absorbing nutrients no matter what you eat. The nutrition absorbed by your system and used by the cells also has a lot to do with timing. Most runners realize it’s important to drink a recovery drink or have a recovery meal within a very short period of time following workouts. If you attempt to refuel two hours after your run, you simply aren’t going to refill your glycogen stores, repair the tissue damage and maximize your recovery as effectively by waiting and eating later. To help doctors understand some examples I have a slide that presents the case of a very interesting runner. She had some posterior tibial tendon discomfort. But she also had a very interesting story. She would develop an unusual pain in her feet when she was running. Yet the pain and discomfort would not really began until she had run somewhere around 25 to 30 miles. But she was a very competitive athlete. She would often when her age group in trail races. During these races her husband would run with her. When she would begin to have discomfort he would actually help her stretch and massage the areas that were uncomfortable until the pain subsided. She would then continue running. In spite of this she would continue racing and stop on the side of the trail periodically just to get the pain to go away. When I present her case at medical conferences, invariably some doctor will raise his hand and say, “Just tell her she is a marathon runner!” After all her pain doesn’t even begin until she’s run about 26 miles anyway. The solution we found for her was not really that complicated. 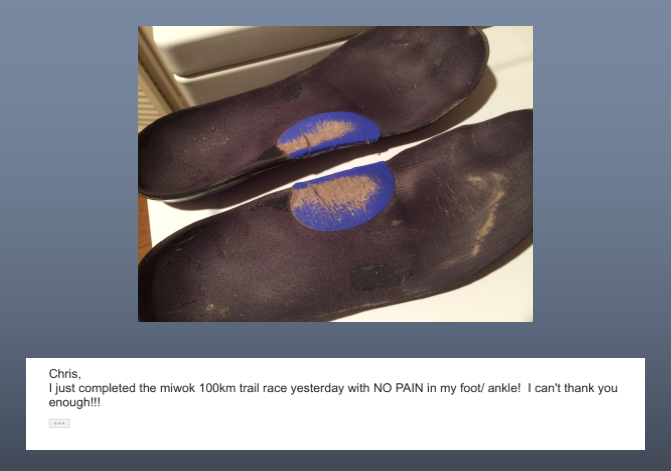 I did make custom orthotics for her and the amount of support provided by the orthotics did remove her initial pain. But because of the amount of support, she was getting friction blisters in the arch. So then we had to add PTFE patches to modify her orthotics to remove the friction in that particular area under her arch. So in the end, it did require a great deal of thoughtful consideration to help her continue running and achieve her goal of competing in ultramarathons. What’s really fascinating about this is that most of the time when I present her case, some doctor will recommend that she run marathons instead of ultramarathons. Again she did only get pain when she was 25 to 30 miles into the run. The next slide in the talk is an actual image of the bumper sticker on her car and I say, “Okay, Doc, that’s her car. Do you really want to call her and try to her that your very best idea, with all of your education, training and years of experience, the very best ideas you can come up with is to tell her to do some activity that she quite obviously does not want to do? You really think she should run marathons instead of ultramarathons?” That doesn’t make any sense. Again we know that with all of these conditions, if you can reduce the stress enough then it should get better. So when a doctor ask, “Which conditions are okay if we patients run with them?” I think about it this way. If the patient can run on it, and we as physicians can reduce the stress on it enough that they can continue to heal, than it should be okay for them to continue to run. Medial tibial stress syndrome, which some people refer to as shins splints (but really which is just one form of shin splints) is something that seems like it could have a very low risk of getting so much worse than it would inhibit your ability to run permanently. Running with medial tibial stress syndrome is probably not going to break anything. If you can decrease the forces or remove the stress that caused medial tibial stress syndrome you should be able to continue running and still heal. Plantar fasciitis is a common cause of foot pain. Plantar fasciitis is most likely the most common cause of heel and arch pain in runners. So it seems to me that with this condition if you can reduce the stress and strain being applied to the plantar fascia ligament should be able to continue to run and heal without risk of real damage. 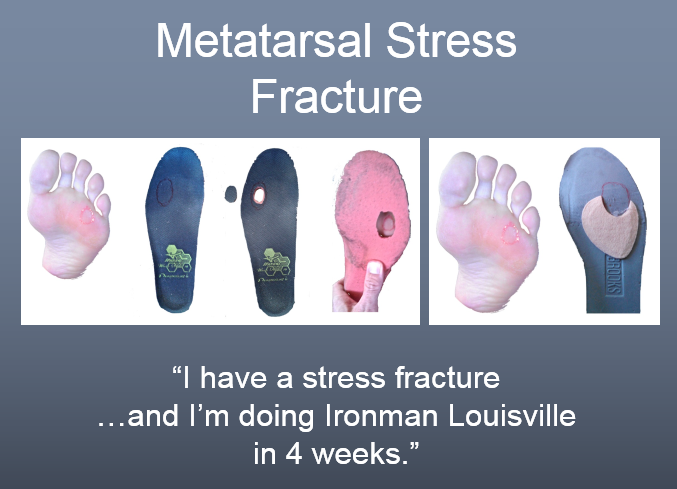 Metatarsal stress reaction is a very early form of a metatarsal stress fracture. In many respects it can be considered as a precursor to developing a metatarsal stress fracture. If you can find a way to reduce all of the stress on that particular metatarsal enough, the metatarsal inflammation should calm down and it should continue to heal. If it continues to heal as you run then there shouldn’t be any concern that it will develop into a chronic problem. In theory, you should be able to continue to run and not have it progress into a full metatarsal stress fracture. If you have insertional posterior tibial tendinitis, you may have irritation at the point where the tendon actually attaches to the foot bones. In that case you really just have inflammation and irritation of that connection. This can result from mechanical irritation where a portion of the tendon is getting squished between the bones and the orthotic or foot bed inside the shoe. If you can get that irritation to calm down and remove some of the pressure, then you shouldn’t make it much worse. If you’re not making it worse then you should be able to continue to run without trouble. 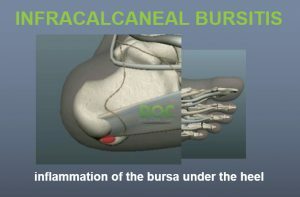 Infra-calcaneal bursitis is inflammation of a small fluid filled sac on the bottom of the heel. This condition often mimics the symptoms of plantar fasciitis. I have seen many runners who have been misled in the course of self-diagnosis and come to believe that they have plantar fasciitis when they actually have bursitis. In many ways this condition is actually a lot less worrisome and has much lower potential for long term disability then plantar fasciitis. Even though it may become painful, there is very low probability that a chronic case of infracalcaneal bursitis will lead to something breaking to the point that you could be so injured that you would be unable to run. Because it seems so low risk I often encourage patients to experiment with different offloading techniques while they continue to run. If you can remove the pressure and irritation of the bursa enough you should be able to continue to run without any real problems. In contrast to the low risk conditions we just discussed there is a group of conditions that seem risky to me. And when I consider risk assessment in a runner, it is the conditions that we know if left untreated, if you continue to run on them, it will almost certainly makes things worse. I also think about whether or not it’s possible to stop any permanent damage from developing. Sesamoiditis is one such condition. The sesamoids are two small bones under your big toe joint. In many ways they’re much like your kneecap. However these bones are very small and they have to withstand an enormous amount of pressure. When they become inflamed they can become painful. 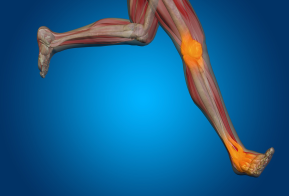 If it is possible to remove enough of the pressure from an inflamed sesamoid bone then it is possible that the sesamoid can calm down even as you exercise or possibly even as you continue to run. The problem with the sesamoid bones is that if they become inflamed and the condition progresses, they can go bad pretty quickly. But it is risky to experiment with the sesamoid bones. While I believe it is true that if you can remove enough of the pressure is often possible to continue to run, the runner and the runner’s doctor have to communicate regularly to make sure that the sesamoid bones don’t become more inflamed and that the condition does not advance to the point of developing a stress fracture in one of the sesamoid bones. If a fracture develops in the sesamoid bones it’s almost impossible to truly fix it. Unlike many other bones your foot we don’t go in there surgically and screw it together and restore it to its original splendor. We either have you decrease your activity or remove the damaged sesamoid bone. Without going into all the details I’ll just say that removing one of the two bones in your big toe joint that you stand on is not a good option for a runner. It simply increases the force on the other sesamoid bone and can redistribute all the forces asymmetrically through your foot when you run. This can lead to a whole host of different problems. Achilles para-tendinitis is inflammation of the covering of the Achilles tendon. This is one of the earliest forms of Achilles tendon problems. It really just involves inflammatory fluid collecting between the Achilles tendon and the covering around the tendon. If the condition is ignored it can turn into full-on Achilles tendinitis. However if the inflammation is reduced quickly and some modification is made in the activity to reduce the amount of stress applied to the Achilles tendon it is possible to continue to run and train without injury. But it is crucial to have continual and close monitoring of the condition of the tendon to make sure that it doesn’t advance to a worse condition that could interfere with your running permanently. It is absolutely essential that you make sure that Achilles tendinitis does not progress to Achilles tendinosis or a rupture of the Achilles tendon. Peroneus longus tendonopathy is a condition in which you have inflammation of one of the two tendons that runs down the outside of your ankle and helps stabilize the bone at the base of your big toe. This condition is fairly low risk, however it can turn bad if you ignore it. Chronic inflammation around the peroneal tendons can lead to tearing or splitting of the tendons that require surgery. So it’s crucial that you work with your doctor to get the inflammation under control quickly. Stable metatarsal stress fractures are early phase stress fractures where the bone hasn’t actually cracked into two pieces. I often let patients run on these types of stress fractures. However, this is only after very close and careful evaluation. In these cases the patient and I also talk in very great detail about the symptoms they have been having and how they can continue to monitor symptoms to ensure any activity is not going to make the metatarsal stress fracture progress and get worse. Many doctors can work with you and help you figure out whether or not it would be safe to run on a stable metatarsal stress fracture. Some doctors will be very opposed to that very idea. Do not fault them for this. Remember, any doctor you see will have your best interests at heart. They want you to get better. There’s an entirely different set of conditions that frankly prohibit a runner from running for a period of time. The reason of course is that there is an overwhelming risk that this condition will progress to permanent disability that will likely prevent running, or at least significantly alter the running experience for the rest of one’s life. In these cases I simply tell runners that it is a terrible idea to run until we can get it to heal. What I mean is that we as physicians really don’t have a way to fix it if it goes bad. 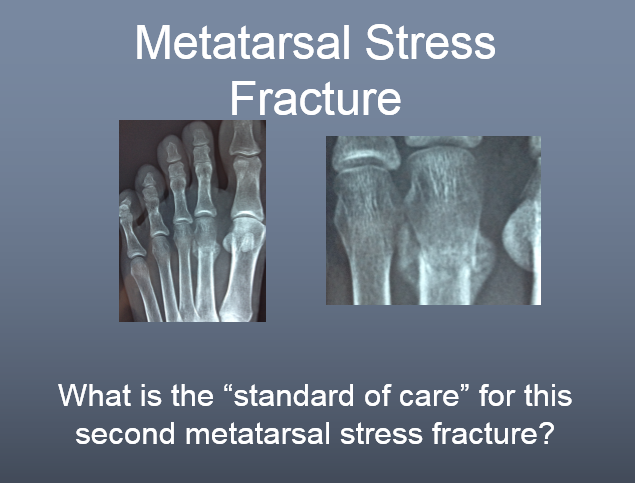 Let’s take the example of a metatarsal stress fracture. If the metatarsal stress fracture is unstable and it actually has a crack all the way around the bone, it will very likely move out of place if you run on it. This is much worse. If the bone moves out of place you may well need surgery to put the bone back in place. The surgeon may have to apply a small plate and some screws to keep the bone in the correct position while it heals. Obviously if you have one of these types of metatarsal stress fractures it would be foolish to go for a run. But even though you did run on it and break the bone it is still possible that a foot surgeon could repair the damage so you might be able continue to run later in life without any real serious changes in your running ability. 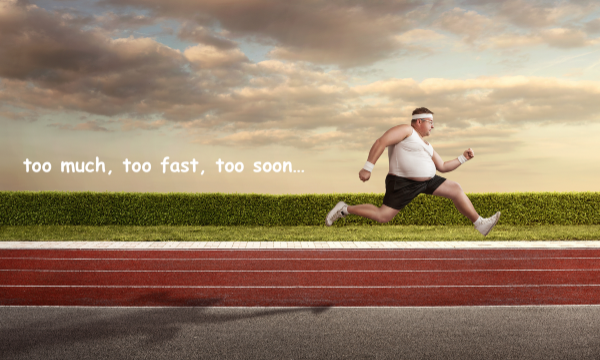 But there are other conditions that could permanently affect your ability to run. A plantar plate injury is a sprain or a tear in a very small ligament at the bottom of the toe. This often becomes injured in runners and the second toe, or the toe next to the big toe. So if you have pain and swelling at the bottom of the second or third little toe joint, it could get much worse. Plantar plate sprains typically get much worse if you simply ignore the pain and run on them. They can get so much worse that the ligament completely ruptures and then the toe dislocates. Once the toe dislocates the only way to fix it is with surgery. The standard approach for a plantar plate surgical repair is through a large incision on the bottom of your foot. As a surgeon and a runner I can say that there is a very high risk of developing a problematic scar as a consequence of having that surgery. If you develop a thick painful scar it could limit your running just as much is the plantar plate tear. I have actually had to do surgery on patients just to do complicated plastic surgery rotational skin flaps to try to move an irritating scar to an area on the bottom of the foot that has less pressure. As a runner, you can understand that this sort of surgery would be very risky. As we mentioned previously an injured sesamoid bone can rapidly degenerate into a sesamoid stress fracture. Sesamoid stress fractures are inherently dangerous. It is just too risky to run on it. I would never, ever recommend that a patient knowingly run on a sesamoid fracture. If the pieces of bone move apart there’s simply no good way to fix it. A calcaneal stress fracture is a stress fracture in the heel bone. Although these are relatively rare as far as stress fractures go they do happen in high-volume runners. The heel bone itself is similar to a hardboiled egg. There’s a very thin outer shell and a soft center. With continued stress you can quickly overwhelm the bony structure. It you continue to run on it could explode apart like an egg dropped on the sidewalk. When a heel bone explodes apart is almost impossible to reassemble in the operating room. You cannot expect your surgeon to put it back together in a way that will function as well as an unbroken heel bone. I think many doctors would tell you that if you break your heel bone your running days are numbered. Since actually breaking the heel bone is so risky I would not advise a runner to run on a stress fracture of the heel bone until it completely calms down. A tibial stress fracture is a stress fracture in the shinbone. Often these masquerade as shin splints. The symptoms are slightly different but because shin splints are so common many runners think that they have shin splints when they are actually developing a much more serious tibial stress fracture. If you run onto a tibial stress fracture it can break. My brother-in-law was telling me a story about someone he knows who developed a tibial stress fracture while training for a marathon. This guy was tough as nails. He continued to ignore the aching sensation in his leg as he continue to train. Not surprisingly, the pain continued to get worse, but he continued to ignore it. On the day of the marathon the discomfort was at an all-time high but he was ready to accomplish his goal in spite of it. Supposedly there’s a video of this guy at the end of the marathon, running down the finish chute, and mid-stride, the tibia snaps in half as he’s approaching the finish line. He actually ran to the point of breaking his leg. Is not a good thing and not something that is easy to fix. The Achilles tendon and the posterior tibial tendon are two of the most important tendons and your entire running system. If you have advancing inflammation of either of these two tendons it is simply too risky to continue to run. Even if you are tough as nails, if you continue to run and make the condition worse you can get degeneration of the tendon to such an extent that the tendon actually ruptures or tears. There are lots of alternatives to running. The main thing that I do when I talk to an injured runner or a group of physicians is to explain the real task is to figure out a way to keep the runner fit. Runners don’t want to lose all of their hard earned fitness. Runners don’t want to lose all of their aerobic fitness. Runners don’t want to lose all of their well-tuned neuromuscular connections that coordinate beautiful running form. You have to develop strategies to maintain the strength and fitness of a runner. Swimming is probably the safest activity for and injured runner. Aqua jogging is another safe activity which simulates the motion of running while floating in the deep end of the pool. Most runners with an injury should be able to do lots of core strengthening. As long as you’re not working out so hard that your body has to recover from a work out that was so intense it takes away from your body’s ability to heal, and diminish your ability to heal the running injury, and you’re not doing anything that causes any pain in the injured area it should be safe. Obviously selectively working the muscles that will help you maintain your core strength shouldn’t really affect your foot or ankle. You can go to the gym and do lots of exercises to help maintain your overall fitness. You can cycle on a stationary bike and in some cases you can even cycle outdoors. 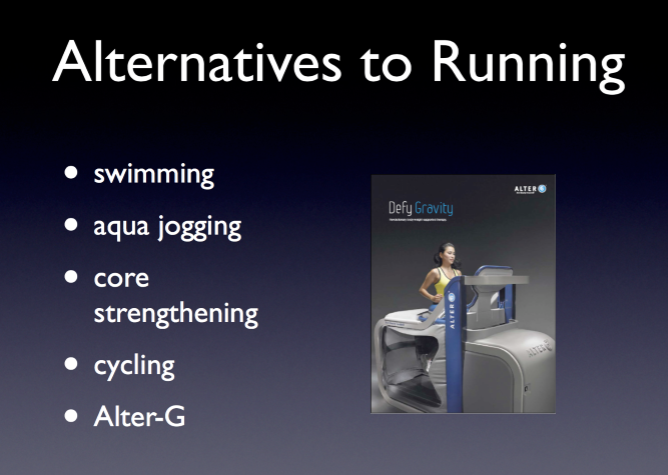 In lots of cases it may be possible to run on something called an Alter G treadmill. This is a special treadmill that actually helps reduce the force of gravity when you run. Regardless of the path you choose you have to figure out what’s really important. You have to figure out whether or not your doctor can help you develop a strategy to maintain your strength and fitness. It may help if you explain to your doctor that you are really concerned about the effects of losing your fitness while you recover from the injury. Explain that in fact you do want to heal the injury, but you’re most interested in evaluating all of the different potential sources of stress that could inhibit your healing and limit your activity or slow your recovery. Remember it’s just math. Figure out the stressors that can cause the condition to get worse. Do less of those. Figure out the things that can reduce your overall stress so your overall chances of healing will go up. Manage those stressors and work with your doctor to reduce all of the global stress as much as possible so you can continue running, stay fit and then keep running for years ahead.